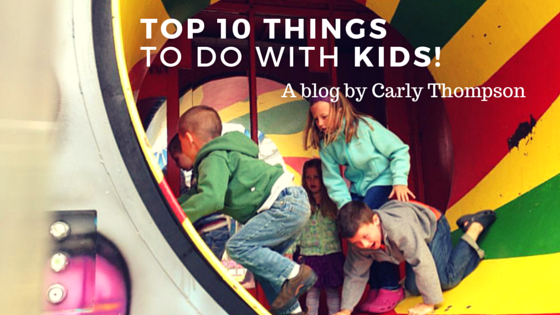 Charlevoix Chamber Times: Top 10 Things to do with Kids on a Sunny Day! Are you visiting Charlevoix with kids in tow, and aren't sure what to do? Maybe you and your kids are local but you don't know what family friendly events are taking place this year. I've come up with a list of 10 kid friendly activities for the whole family to enjoy on a sunny day! Check out next week's blog for the rainy day list of kid friendly activities. Tour the extensive grounds of the historic Castle Farms! Kids will love the garden railroad with trains galore to play with and explore. Check out their calendar of events for year-round kid friendly activities such as: Enchanted Story Time, Fairy Garden Make & Take, and Santa's Train Wonderland! Visit www.castlefarms.com for more information, tour times, and prices! 3. Watch a Movie in the Park! Throughout the summer moths, on certain Mondays we have movies in the park! Come down to East Park Pavilion with your camp chairs or blankets and watch a free movie. The Monday of July 20, Big Hero 6 will be showing. Click HERE for the complete schedule of movies in park! 4. Play in the Interactive Water-fountain! Right in the heart of our downtown East Park is the interactive water-fountain! Take your kids and let them splash around on the fountain pad of 23 programmable water nozzles, heated water, and the signature center nozzle capable of sending a stream of water as high as 30 feet! Open from 10am-9pm on interactive mode and then switches to display mode for a light show from 9:30pm-11pm. 5. Enjoy the beaches and hunt for Petoskey Stones! There are five public beaches in Charlevoix each beautiful and fun for the kids to play at: Depot Beach, Ferry Beach, Lake Michigan Beach, Mt. McSauba Beach, and Fisherman's Island State Park! Petoskey Stones can be found at any of these beaches along the shore. They are ancient fossils unique to the northern Michigan area with a fascinating history! Check out last week's blog post Petoskey Stone Lore for more information on our iconic state stone. There are playgrounds and volleyball nets at Depot, Ferry, and Lake Michigan Beach as well as basketball courts at Ferry Beach providing a full days worth of outdoor activity! 6. Rent a boat and go tubing! If you want to spend a fun-filled day on the water but don't have a boat, no problem! There are several places here in town to rent boats, jet skis, and more! Pontoon boats are a perfect fit for large families to unwind on the lake, drop the anchor and take a swim. Or rent a speed boat with a couple of tubes for the day, and enjoy your water-sports! The most popular paved bike path in the area is the Little Traverse Wheelway which connects Charlevoix, Bay Harbor, Petoskey, and Harbor Springs. The trail begins by the Nazarene Church on Waller Road off of US 31 on the north end of Charlevoix. Check out www.upnorthtrails.org for more information on trails in the area you select! 8. Grab an ice-cream cone! On a hot sunny day, stop and take a break at one of the many ice-cream shops in Charlevoix! Indulge your sweet tooth in soft serve cones or avalanches at Dairy Grille, try a tasty hand dipped ice-cream in a waffle cone at Kilwins or Celeste Murdick's Fudge & Candy Kitchen! 9. Play on the playground! Are the kids getting antsy? Take them to the playground! Let them romp and play at St. Mary's School playground right in town, the playground at the Charlevoix Elementary School, or the playground at the Round Lake Education Center on 108 East Garfield Ave, Charlevoix, MI 49720 | (231) 547-3206. 10. Have some Fun at the Farms! From u-pick fruits, to corn mazes, to petting farms and more, enjoy the fun-filled activities at our area farms and orchards! Stop by the Farmers Market held every Thursday in East Park from May-October! Check out the Farmers Market Facebook page!